VISUAL PHOOEY! : ARTISTS VS EARTHQUAKES!!! The very talented Sylvain Marc and Paul Nicholson are organizing an event called 'Artists Vs Earthquakes' in London in aid of Artists Help Japan, a charity created by Pixar's Dice Tsutsumi. The opening night is from 7pm on Saturday 7th of May at Cafeand. There are a whole host of amazing artists from the worlds of animation and illustration exhibiting and selling their wonderful wares including Uli Meyer, Dice Tsutsumi, Sylvain Marc, Neil Ross, Veronique Joffre, Rikke Asbjorn, Dave Needham, Michael Schlingmann, Alan Kerswell, Matt Layzell, Rich Wake, Chris Sasaki, Matt Jones, David Z Greene, Mario Cavalli, Genevieve Godbout, Anotoine Birot, Boris Hiestand, Simon Tofield, Simone Lia, Pete Western, Paul Nicholson, Tom Gauld, Daniel Greaves...phew! And that's only touching the tip of the ever growing line up of phenomenal talent involved. Check out the blog here to see details of the exhibition, view the pieces and find out how you can bid on the great artwork on offer. I've got three pieces in the exhibition. There's the one above which is a framed original Pinky Malinky comic (Arcylic and Ink on Heavy stock water colour paper, image size 38cm x 23.3cm). 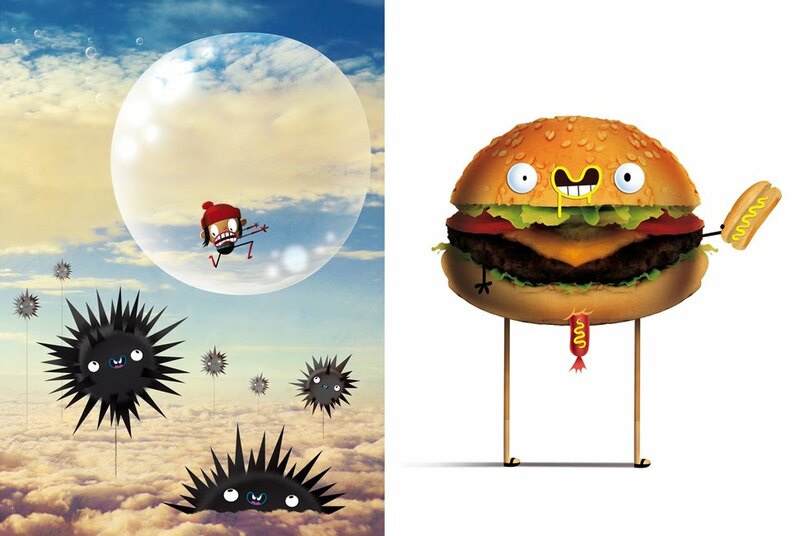 Then there's the two pieces below, Bubble Trouble (signed and framed 29.7cm x 42cm digital print) and Cheesey-Burger (signed and framed 29.7cm x 42cm digital print). Happy Bidding!!! 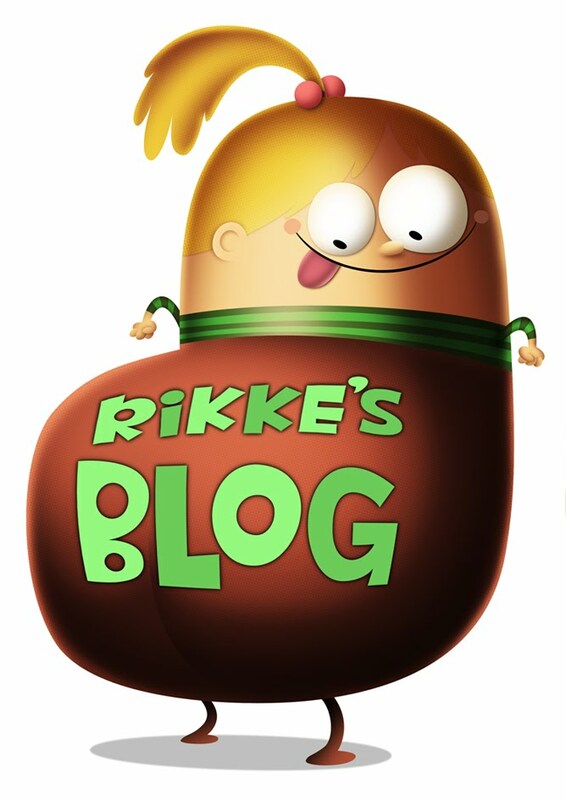 Also I'm happy to announce the amazing Rikke Asbjorn (creator of Little Rikke and The Furry Pals, as well as animator of the Gorillaz, the 'Monkey: Journey to the West' Opera and much commercial work for the award winning Passion Pictures and many other animation studios around London) has started a new blog and promises to update it with her brilliantly funny and ridiculously charming drawing and characters. Why don't you go over and say 'hey'!!! She also has a great piece in the exhibition above, which if you don't buy it I will! 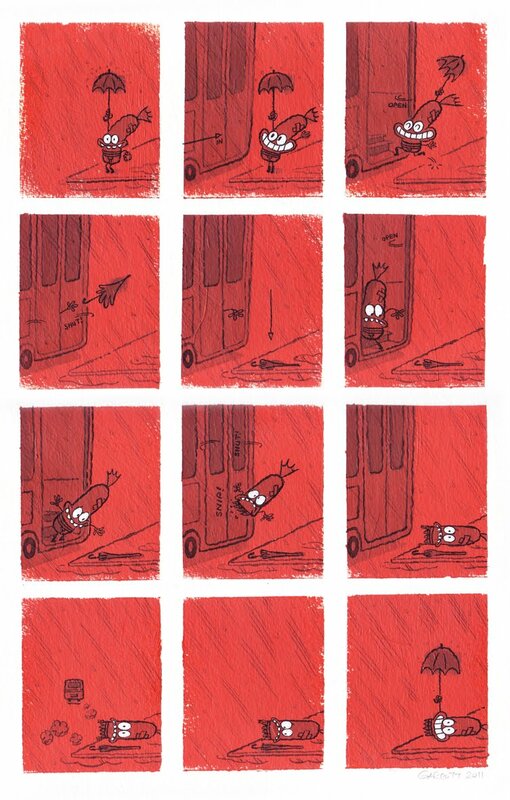 Brilliant comic. And super cool that you participated in the relief effort. I'll be back for more. Thanks Anthony! Glad you like my work! Cheers Paul! And well done to you and Sylvain for organizing the exhibition, great stuff! 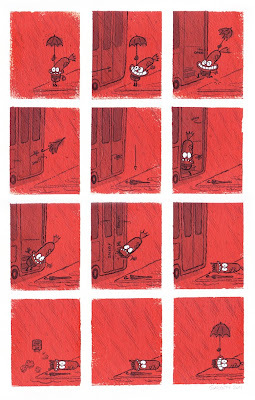 your comic strip is realy funny, I love this type of drawing you have on it.